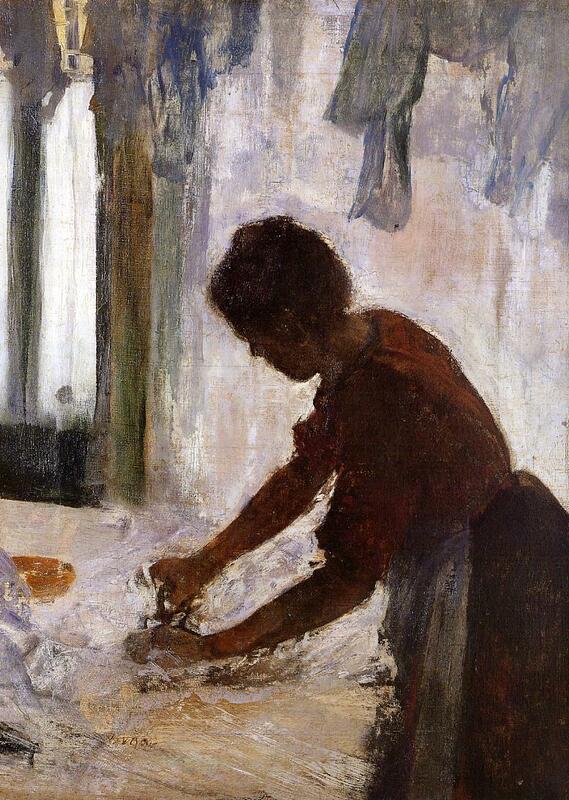 Woman Ironing (Silhouette) by Edgar DegasAll week I collected cheery thoughts. I am thankful for this, this and that. I adopted the simple satisfaction of one who lives lightly, writing: small bird, blue sky, watermelon. You know, the kind of pollyanna blather that drives you crazy if you're feeling less than cheerful. This morning, I was in iron mind: slow and firm. The world felt full of clamor, too many opinions and expectations, and I just wanted to fold towels and iron shirts. The mind and body reaches for order. You can't rush an ironing job. Or, you can, but your wrinkles will reveal a hurried mind. No one irons anymore. My nearest dry-cleaner, 25 miles to the north, has shut down, as has another shop 25 miles to the south. I'm pressing my shirts, knowing that no one within 50 miles is dressing smoothly. Don't worry, I don't iron my jeans. That's just weird. I use spray starch. I like a crisp collar. It's probably bad for the ozone, but rumples are bad for my mental health. Leaning into my task, I think of pressing on. When I was a teenager, my uncle and I attempted suicide on the very same day. We weren't close and he lived worlds away, but for one day we were connected through our own desperate acts. One of us survived. So much of life depends upon chance. And wrinkles. And a good balance of cheer. Newer PostDo you know the Oracle? Older PostDon't miss a minute, a word, a thought . . .